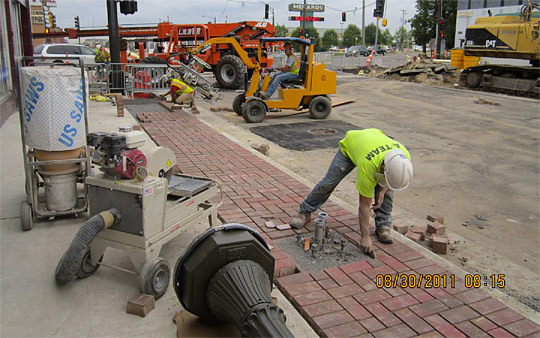 Structures Hardscapes Specialists install about 500,000 sf of permeable pavers annually, nearly all of it mechanically with Pave Tech Probst machines. Installing permeable, pervious and porous pavements allow you to solve problems and gain more business. Stormwater runoff regulation isn't the only issue driving the growth in pavements that allow drainage into the subsurface. In the freeze/thaw environment of the snowbelt, the near elimination of ice is a huge selling point for liability/safety conscious clients. In the concrete jungles of our inner cities, high-volume drainage pavers are a cost-effective solution to flooding. There is also a growing class of green-conscious consumers – homeowners, colleges and businesses – that want to reduce their contribution to the stormwater runoff problem. 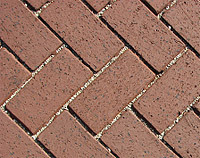 Learning what different drainage paver options can do for your clients helps position you as the expert in your area that people look to for all paver projects – whether there are special drainage concerns or not. In his white paper "Pervious, Permeable, and Porous Pavers – Are they really the same?" Mark Walker of Kuert Concrete identifies 3 main types of segmental drainage pavers (pavements not poured on site) mainly geared for pedestrian or vehicle traffic. 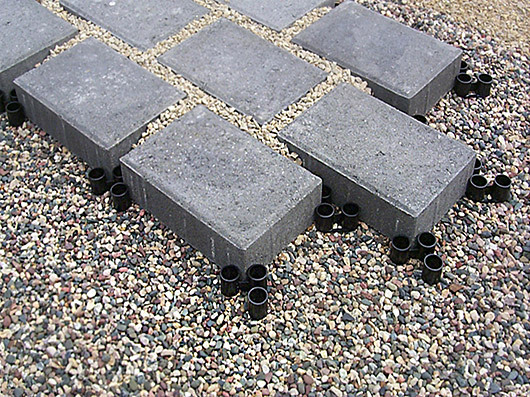 Permeable pavers – Allow drainage through the gaps between pavers. 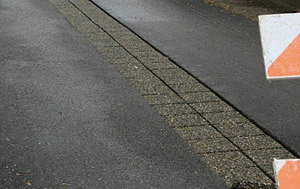 Pervious pavers – Allow drainage through the pavers themselves. Porous pavers – A cellular grid often made of concrete or polyethylene that allows drainage through cells typically filled with soil/grass seed or gravel. All 3 pavers are placed over a similar drainage aggregate bedding, base and sub-base. Chad Johnson's crews at Structures Hardscapes Specialists install more permeable pavers than any other pavers, about 500,000 sf annually. He says the driving force behind most of those sales is winter safety. "I saw the big increase 4 or 5 years ago. I found out the colleges and businesses we work with, their number 1 fear in the northern states is standing ice on any surface, because standing ice is an insurance hazard. With permeable pavers, they don't have any standing ice. 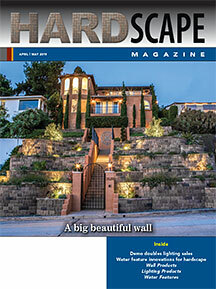 They are switching all their surfaces to permeable, and that is the number 1 reason why they're doing it." In the freeze/thaw world of the north, snow that melts on a sealed pavement forms puddles that refreeze to ice. Chad says permeable paver systems don't allow puddling as melted snow drains down to the drainage aggregate below the surface. He says permeable clients reduce their salt usage by up to 80%. Plows clear the bulk of the snow, ice melt is applied and the water goes away. Chad says stormwater management is an added bonus. 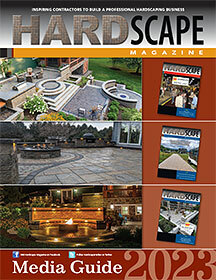 They work with clients in a design/build process where he can influence paver selection. 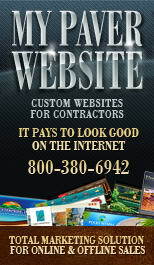 "And you can't argue with the advantages, especially in the climates that we work in. It's more cost effective to manage your stormwater thru a permeable system versus storm drains and gutters and detention ponds. As the world becomes more populated and land becomes more expensive, people are building fewer detention ponds and channeling water underground into permeable systems." 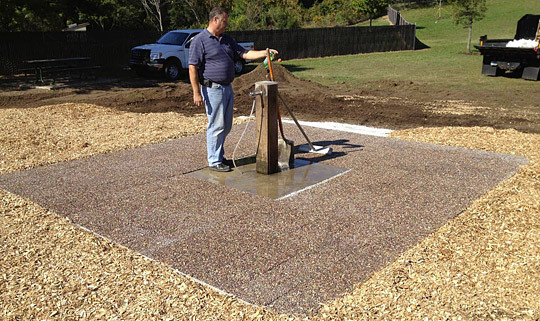 Roger Henjum's company, Concrete Paver Systems, has installed permeable pavers in his Dallas/Fort Worth market to solve a variety of problems. One of them was a 75,000 sf BMW parking lot that lacked room for a detention pond and access to an adequate sewer line. "Well, a permeable paver installation is a detention pond right underneath your parking area. With your number 2 rock and your number 57 rock below, it creates a holding area for the runoff. Then it slowly releases into that little 12" sewer line." Roger says the ability to collect stormwater for reuse has made permeable systems more popular in areas of Texas facing record drought. "We'll put in a non-permeable liner that keeps the water from draining away. Instead, it goes into a drainage system below grade to a storage tank to be used later, usually for irrigation." 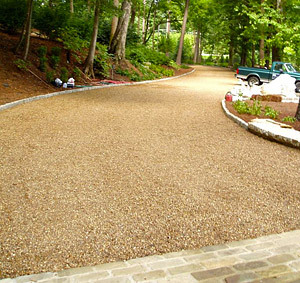 Concrete Paver Systems installs similar permeable systems in driveways for ecologically-minded homeowners. 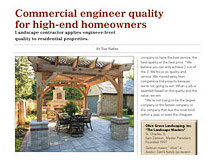 "We've also put permeable pavers in large patios built around big trees where the client wanted to make sure that rainwater could get into the root systems." About 1/4 of Structures Hardscapes Specialists' permeable work is done using alternatives like paver spacers and pedestal systems. 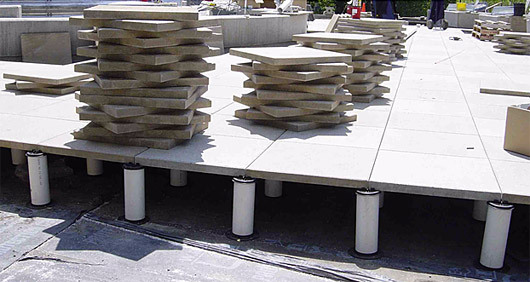 Paver spacers allow them to create a permeable installation using non-permeable pavers like architectural slabs. Chad says a high profile university commons area would be a typical application. The Pave Tech Enviropave spacers Chad uses come in different sizes to create gaps from 1/8" to 2". Ross Causey, an ICPI permeable paver instructor and a residential contractor in Kennett Square, PA, says permeable pavers are a small percentage of his work right now. "But it's definitely growing. And I like to see anything growing rather than trending down." "Drainage is one of the first considerations in any work we do because it affects everything we do. And PICPs [permeable interlocking concrete pavements] solve drainage issues for our clients. Their municipality may say they can't put on an addition because they've exceeded their impermeable coverage for their lot. "We can reduce their impermeable area by doing things like taking the downspouts of the house and draining them right into a permeable installation. As long as it's designed properly with enough stormwater storage capacity, that removes the roof area from being considered as impermeable space. So they can put on that addition." Ross says permeable pavers are becoming a more widely recognized drainage solution. The greatest recent stride forward has been the EPA officially naming PICP as a Best Management Practice. Ross says this has been huge because it has given PICPs immediate credibility with local officials and they have become more open to accepting and ultimately recommending PICPs. "We've all considered PICPs to be the future for a long time. And it's coming on slowly, granted. PICP is another arrow in our quiver of tools because a lot of guys don't want to fool with them. 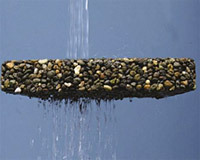 Those who become known for providing PICP drainage solutions will be the go-to guys when permeables really catch fire." Pedestal pavers are another type of permeable system. They typically install with an 1/8" seam to allow water flow. A pedestal is basically a stand that elevates the paver in the air. Water drains thru the seams to a drainage system below, often a roof. Contractor Chad Johnson says, "We've seen significant increase in demand for pedestals in some of our markets. They're big in multifamily housing 2nd or 3rd story pool areas. We used to see wood decks up on roofs. We don't see much of that any more. People want pavers. It's more of a permanent system, and it's also adjustable. You can pick up a slab and replace it. If there's any settling, you just reset the pedestal." Photo courtesy AWS™ Pedestal Systems. When you need extremely high flow drainage, pervious pavers could be the answer. Water flows through pervious pavers, no around them. Xeripave pervious pavers are manufactured from natural stone bonded together. Because of the high flow drainage, the manufacturer says their pervious pavers are only needed to cover about 15% of a typical project's total surface area for optimal drainage. The city of Chicago's Department of Transportation was intrigued by the potential for pervious pavers to inhibit flooding. So 3 years ago they began a pilot program. Project Manager Ibrahim Hadzic says pervious pavers allowed them to do partial reconstruction of alleyways with just a 2'-wide strip in the center of a 16'-wide alley, and achieve good drainage. In the past, in the same application, the city had tried using a 4' wide strip of poured porous concrete. Ibrahim says, "It was far less work to install the pavers. The area can be much smaller because the paver's infiltration rate is much higher." The area around this dog park water source is no longer a mud hole since Alex Fisher installed Xeripave pervious pavers around it. Plus, porous concrete cannot be cleaned (unlike pervious and permeable pavers), and some of it was clogged. Ibrahim says a 1' strip of pervious pavers installed thru the center of the clogged porous concrete was all that was needed to restore adequate drainage. Beneath the paver surface the city specifies a high capacity detention/infiltration system, typically a 4' wide x 5' deep trench filled with drainage stone. Ibrahim says, "We have had promising results and I expect to start using it more. If I compare the cost of pervious pavers to the cost of other solutions, they are around 20% less expensive. Which is quite a lot. "In my opinion there is one huge advantage no one is talking about: The pervious pavers are the highest level of environmentally friendly material. If you need to modify or repave an alley, you can take the pavers out and reuse them. Other materials have to be recycled. They must be excavated and taken away to be crushed and reprocessed. And in their place you put new material." Away from the big city lights of Chicago, contractor Alex Fisher envisions a lot of pervious paver uses on a much smaller scale. He recently installed a 16' x 16' pervious paver area at the Mishawaka, IN dog park. "The dog park's watering source was on a small concrete slab. So the water would run off that and there was a mud hole around it. Pervious pavers are probably the best thing we could have done. There's no mud hole at all anymore. The people who use the dog park can't say enough about it." Alex says the area has sandy soil that drains well so they only installed a 6" base of number 8 limestone below a 1" bed of number 11 limestone and it drains well. "I've proposed it for the concrete splash pads in city parks. It's the same kind of scenario. Water runs off of the splash pads into the grassy areas worn down from the foot traffic. So it's slippery, and kids come off of there with muddy feet. I want to extend the edges of the splash pads to eliminate that issue. "I think it would be great for driveways. In the winter, if you keep it cleared you won't have ice issues. It would eliminate liability on sidewalks. And keeping them clean is simple as using a shop vac." In addition to permeable pavers, Roger Henjum installs his share of porous pavers, some planted with grass, others filled with gravel. Some made from concrete, others made from polyethylene. This article focuses on the Invisible Structures polyethylene variety he's been using recently. 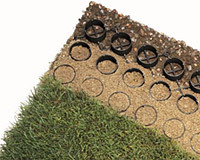 Polyethylene paver sheets are typically held in place by spikes driven into the ground, or by roots in the case of most grass paver installations. Roger uses a base aggregate mix that includes fines, but that also drains. Roger has a church parking lot project coming up using Invisible Structure's Grasspave2, a high density polyethylene cellular grid porous paver. Since the parking lot also serves as the church's lawn, this porous system allows it to be grassy rather than concrete or asphalt. Roger says a church parking lot is a good application for grassy porous pavers because it's used mainly on weekends so the grass won't take a beating. This project is unusual in that there's another layer of porous pavers 12" down, below the drainage aggregate layer with an impermeable liner beneath it. Roger says, "This property has some real sorry soils. They don't want the water getting into the subgrade. It's graded to the low end where there's a sump pump so they can reuse the water." The porous pavers at the bottom serve as a "drain core." They're wrapped in a filter fabric and become the drainage area where the water can travel freely. Roger's also used grassy porous pavers for projects like fire lanes and overflow parking. "It's not something you want to drive on every day because you want the grass to grow." Roger says porous pavers that use gravel are very similar to those that use grass. You just fill the cells with different material. He uses gravel in areas where the client needs a porous paver, but where there's too much traffic for a grass paver application. He's done several gravel porous paver parking lots, access roads, fire lanes and other applications. Unlike gravel alone, gravel porous paver installations hold their structure. You won't have pot holes or puddles. Instead, you will have a well-graded drive with a uniform look that doesn't need filling or re-grading. Landscape Architect Greg Alvarado has found porous pavers a nice addition for the high-end residential projects he installs in Denver, CO. He chooses the gravel pavers for the look. "I like the strength for parking a couple cars on it or just adding a parking spot. It's always nice and level and clean, and I just always like that look. You put granite chip on top of that and it looks great. Same with patios. Furniture can sit on it a lot better. It's relatively easy to shovel snow too. The shovel just glides across the top." Greg has found grass porous pavers great for protecting lawns from vehicles. He often uses it next to driveways where drivers have a difficult time staying on the pavement. The drive may be too narrow, too curvy or too busy. A typical installation might be a 2' wide strip along the edges of the drive. He's also installed it along curbless streets where people sometimes park on the grass and create ruts. Take some time to learn how to use permeable, pervious and porous pavers to solve problems for your clients. The opportunities continue to grow every year.